Individual quick freezing (IQF) is a technology which is used in the food industry to keep variety of fruits, vegetables, meat, poultry and sea food products fresh for longer duration and to streamline the supply chain of these with rare chances of loss or damage to the stored products at -30°C to - 40°C temperature and prevents development of microorganisms which causes staleness and bad odour from the products IQF meat. 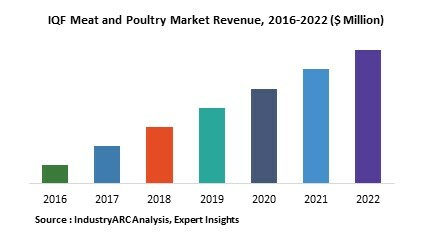 Globally increasing demand for the packaged food and changing lifestyle of the people in developing nations is expected to remain key growth drivers for IQF technology in meat and poultry industry. This report identifies the IQF Meat and Poultry market size in for the year 2015-2017, and forecast of the same for year 2022. It also highlights the potential growth opportunities in the coming years, while also reviewing the market drivers, restraints, growth indicators, challenges, market dynamics, competitive landscape, and other key aspects with respect to IQF Meat and Poultry market. Geographically North America dominated IQF Meat and Poultry market owing to developed infrastructure, higher consumption of packaged food material, large food industry and strict regulations by FDA in the region for packaged food. North America was followed by Europe and Asia-Pacific as the second and third largest market for IQF Meat and poultry in 2015. However, Asia-Pacific is expected to remain fastest growing regional market driven by changing life style of the people, developing infrastructure in major economies in the region such as India, China, Japan and South Korea.